For passengers holding Bangkok Airways (PG) ticket (ticket number start with 829) traveling on any route involving Bangkok as a part of the ticket itinerary. Rebooking from the original traveling date between 14 October and 15 November 2011 could be done under the same Passenger Name Record and same booking class. The new booking must be traveling on/before 15 December 2011. Upgrade to a higher booking class is permitted with charge of differential fare and without any fee. Remark : In order to receive prompt assistance, contact should be made at the original point of sale and/or where the tickets were issued. If tickets were purchased through a travel agency, please make contact with the facilitating agent. If tickets were purchased directly through Bangkok Airways reservation center or online reservations (www.bangkokair.com), please contact 1771 (26 October 2011 07:30 - 20:00, 08:00 - 17:30 Weekdays, 08:00 - 17:30 Weekends) or reservation@bangkokair.com. 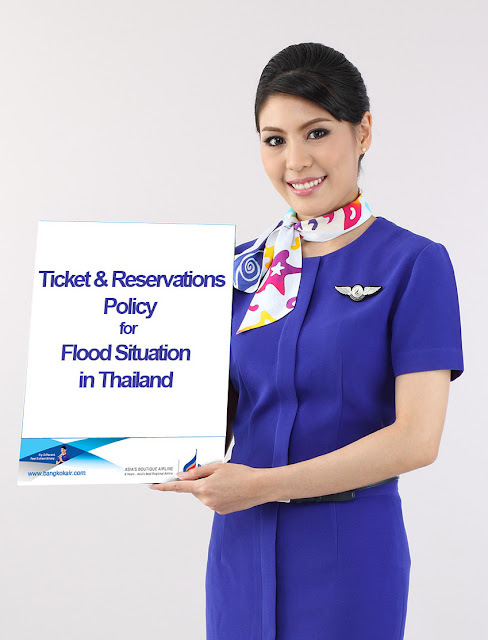 Due to the current flooding crisis, delays may be experienced when contacting Bangkok Airways for assistance with booking changes and/or refunds. We apologize in advance for any inconvenience caused and thank you for your patience and understanding.